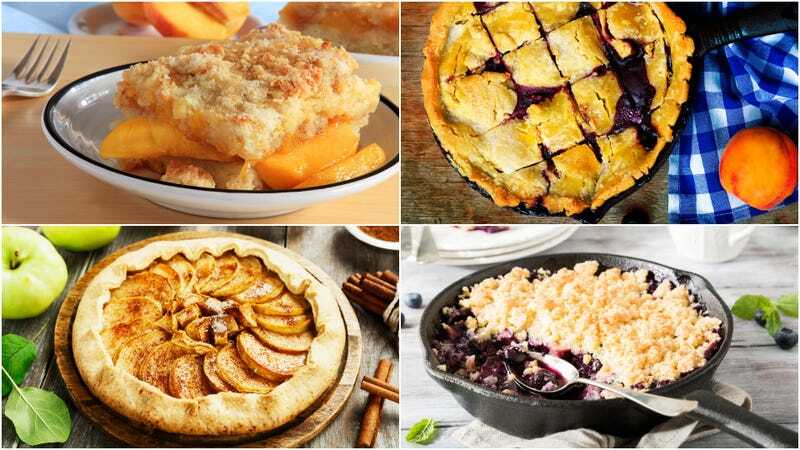 What’s the difference between a crisp, cobbler, crumble, buckle, galette, and pandowdy? As holiday baking reaches its peak, you’ll catch me with any excuse to avoid making pie. I’ve made only a few incredible pies in my time. The rest: fine, but forgettable. Soggy bottoms, cracked tops, butter cut too small, filling too runny. With so many potential pitfalls, I can’t even be mad at myself. A perfect pie is a tall order. In fact, pie feels like the riskiest way to marry hot baked fruit and some form of sugared carb. Are you team butter or team shortening? Or do you combo? What if your chosen fat is too warm? Cut too big? What if your dough is too wet? Too dry and cracked? What if you didn’t deep-freeze every piece of equipment that touches the dough, including your own hands, for less than 12 hours in advance? Did you blind bake first? What do you mean you didn’t? What do you mean you don’t know what that means? IT’S NOT FLAKY WHERE ARE THE FLAKES THIS PIE IS AN ABOMINATION. See where I’m going here? Look, biting into an excellent piece of pie can be positively transcendental. But if you’re crunched for time, or wake up with night sweats about flat, oily pie crust, or simply feel less than 100 percent up to the task of just absolutely nailing it, it might be time to educate yourself on the host of equally cozy, yet under-sung fruit and pastry dessert heroes. The best part: they’re all just as worthy a partner for a scoop of ice cream. If you feel pretty good about your pastry game but less great about your fitting and crimping skills, a galette could be the way to go. It’s free-form, so you don’t need a pan, and only enclosed on the sides using the excess dough you’d ordinarily trim off or crimp on a traditional pie. You can create a circular or rectangular shape simply by folding the dough over the filling. Speaking of filling, galettes require a lot less of it, which means you’re off the hook with blind-baking for a crisp bottom. Bonus: galettes are highly Instagrammable (if you’re into that sort of thing) and look cute as hell with an egg wash and a bit of sugar sprinkled over the top. Let’s be honest: You could eat any of these desserts for breakfast because you’ve only got one life and it’s this one. But if you or someone you’re serving is one of those people who like to at least pretend something on the breakfast table is wholesome, make a big ol’ crisp for your holiday feast and heat up leftovers for breakfast the next day. Crisp is the one fruit-and-pastry dessert in this group that traditionally calls for oats in its crunchy, sweet topping. Sort of like a streusel-meets-granola situation, crisp topping usually involves oats, sugar, butter, flour, and sometimes spices. Pantry bare? No problem. A crumble is merely a crisp without the oats. Peel and chop those apples or pears languishing on the counter, or grab the berries in your fridge, toss ’em with a bit of flour and maybe sugar, and top with a combination of flour, butter, and sugar that you’ve mixed to form—you guessed it—a crumbly texture. Convince everyone you’ve got your act together by throwing in a mildly surprising element like ginger, Chinese five spice, or lemon zest to make it special. What I love about cobblers is that they’re sort of a two-for-one: not only do you get a warm, juicy fruit filling, you get it with a fluffy, buttery biscuit on top. Make it a little fancy by cutting out individual biscuits (you can use a water glass if you’re a normal person and don’t own a biscuit cutter) and baking them on top, or make it more casual by spooning the dough in craggy heaps over the fruit. Either way, you’ll be met with a biscuit that’s crispy on top and warm and soft underneath from the baked filling. It’s okay to admit it: I’m a cake person, too. And that’s a bold confession because I come from a long line of pie-making farmers and I’m hoping they don’t read this article. A buckle gets us closer to more of a 2:1 ratio of pastry to fruit: It’s a dense cake with fruit mixed into the batter plus a crunchy streusel topping. You could count buckle as a runner-up in the breakfast category because it’s rather similar to a coffee cake, just without the weird, stale royal icing. Buckles are often made with summer berries, so making a cozy apple version means you’re edgy. On some level, admitting you messed up is in the pandowdy’s name. In essence, this 19th-century dessert is a pie with a “dowdied” top crust. Instead of getting rolled in a single layer and fitted over the top of the pan, the dough is cut into irregular squares or other shapes and shingled imprecisely over the fruit filling. Before baking, you push down on the squares of dough to submerge them slightly into the fruit, which thickens the filling and makes for a soft pastry top. So if you’re less than confident about your dough, or don’t have time to blind-bake the bottom crust, or just stopped caring like an hour ago, a pandowdy is your path to improvised redemption. It might feel haphazard, but it’s charmingly so. Now only you’ll know about your pie fail; family and friends will just think it’s “rustic,” because it is.